Not a bird to get the pulse racing, at least to someone born and raised in NW England. 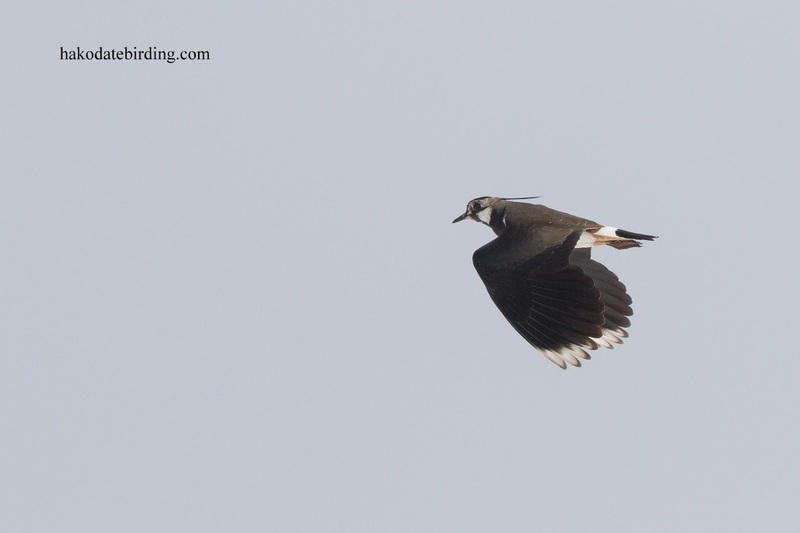 A (Northern) Lapwing, a bit of a scarce bird in Hokkaido. I see about one a year and this individual seems to be the one from 2016. We just got back from a night at Lake Toya, this was one the way home. It was being harried by crows, not sure why they'd do that but anyway they wouldn't leave it alone and I hurriedly took a burst of BIF shots as it flew by before it disppaered into the snowy fields. About a 50% crop, this rather poor effort is pretty much the only time I've ever photographed a Lapwing. Unfortunately this lovely bird has suffered a huge decline in numbers, don't know if it's habitat, persecusion or both, but I certainly miss their "wiffling" and that plaintive "Peewhit" call. Hi Derek, I'm sure it's due to changes in farming practices. Sad to witness but there were a few displaying along the Ribble last May at least. Surely one of the most stunning plovers in a family of gorgeous birds. I sometimes see them at Fukushimagata in Niigata. Small flocks. I love the way the fly. When I'd see them come across the wetlands it would get the attention of a raptor or two. I haven't managed any pics for a couple of years. Maybe I haven't seen them since 2011. We get the odd N.Lapwing here in HK in the winter - handsome birds...; In full breeding plumage (such as I've seen in the UK) they are spectacular!